As we told you yesterday, Lost City recently posted their last vanishing New York post… but what we didn’t mention was that before they signed off they left us with a list of classic New York joints worth patronizing before it’s too late. 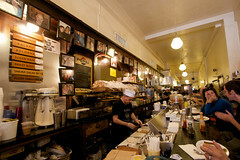 While there aren’t too many true Midtown Lunches on the list, Oyster Bar, Sarge’s Deli, and the recently written up Flatiron Lunch, Eisenberg’s Sandwich Shop, get recommended as do some fave ML happy hour haunts like Rudy’s and Holland Bar. Now last summer Rudy’s was on the brink of disappearing as well, so it all goes to show you, don’t take the places you love for granted. Posted by Brownie at 8:30 am, June 15th, 2010 under News.